A macroinvertebrate-based multimetric index was developed for River Chanchaga, North Central Nigeria. Macroinvertebrates and physicochemical variables were sampled seasonally between March 2017 and February 2018 from four stations: station 1 (least impacted control station) and three downstream stations 2, 3 and 4. A total of 29 macroinvertebrate metrics in four categories, richness, abundance, composition and diversity, were evaluated for their potential to discriminate between the stations, seasonal stability and redundancy. Of the 29 metrics, only 13 fulfilled all criteria and were then integrated into the final Chanchaga multimeric index (MMIchanchaga). Application of the newly developed multimetric index revealed that water quality at stations 2 and 3 was fair and that of station 4 was poor. Water quality deteriorated slightly during the rainy season compared with the dry season. In terms of the individual component metrics, EPT richness, EPT (%) and Shannon diversity were highly sensitive to water quality impairment. The Bray–Curtis similarity measure revealed that stations 2 and 3 were more similar compared with the similarity between other stations. Overall, the newly developed multimetric index proved useful and represents the first important step in such index development in Nigeria. We acknowledge the doctoral research grant awarded to the first author (grant no. 110894) by the South African National Research Foundation (NRF) and the World Academy of Science (TWAS). We thank Mr. Obinnah Odoh, Mr. Prince Ossai, Helen Adekunle, Meshack Sanda, Hassana and Mrs. Edegbene Ovie Tega for their field, laboratory and technical assistance. Cranston, P. S. (2000). Electronic guide to the Chironomidae of Australia. http://www.entomologyucdavis.edu/chiropage. 29/08/2013. Hammer, Ø., Harper, D. A. T., & Ryan, P. D. (2001). PAST: paleontological statistics software package for education and data analysis. Palaeontologia Electronica, 4(1) 9Pp. http://palaeo-electronica.org/2001_1/past/issue1_01.htm. Accessed 1 July 2015. Shull, D. R., Smith, Z. M., & Selckmann, G. M. (2019). Development of a benthic macroinvertebrate multimeric index for large semiwadeable rivers in the Mid-Atlantic region of the USA. 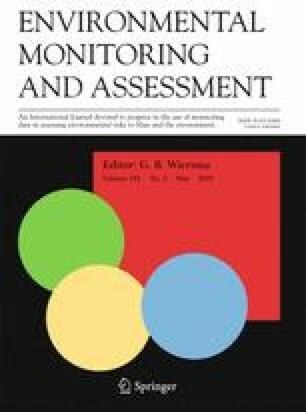 Environmental Monitoring and Assessment, 191. https://doi.org/10.1007/s10661-018-7153-x. UN-(United Nations) Water. (2011). Water quality http://www.unwater.org/donwloads/waterquality policybrief.pdf. Accessed: 1 July, 2015.